President Trump, recognizing the inevitable, has disbanded his business advisory councils to preempt the tidal wave of resignations that was in the offing. Given my long-standing views about chief executives lending legitimacy to the Trump administration, I was delighted that a group of CEOs forced this step. It is a stunning development with more to come. Who could have imagined business leaders would be actively stepping away from a Republican president whose economic program is centered on business tax cuts and regulatory relief? Or that an incoming president could take his popularity down to 34 percent within seven months? 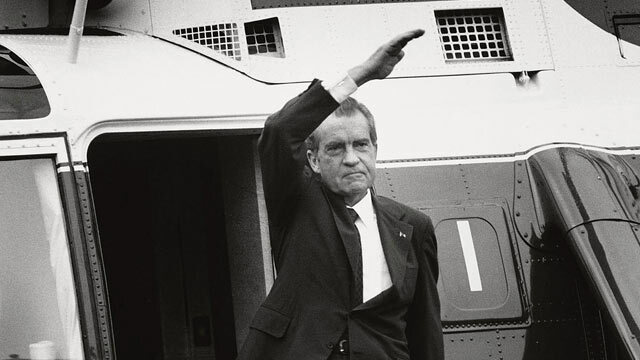 Considering polling data, legislative relations and connections (or lack thereof) to elites, I think it is safe to say Trump is more bereft of support than any president since Richard Nixon in the months before his resignation. To be sure, Summers is a Democratic loyalist but the points he makes above are sound. [W]hat about those who serve in the administration? If I worked for a president who behaved like this one, I would surely resign. Disregard for my policy concerns would be one reason. The purpose of Tuesday’s news conference was to highlight initiatives to streamline infrastructure renewal — all lost, as they so often are with Trump. Incivility, and the mocking of political opponents and colleagues like chief strategist Stephen K. Bannon would be enough to get me to go. And I would not, in any environment, work for someone who, after reflection and advice, gave quarter to racism and anti-Semitism in the way the president did on Tuesday... those surrounding Trump would best to demonstrate to him the need to reset or resign by following the CEOs’ lead — withdrawing their cooperation and no longer lending their legitimacy to his disastrous presidency. Trump may have a thick sliver of support in the hinterland but he has none in any part of the establishment. He just doesn't have the political savvy to keep some people around that will protect his back. You can take on parts of the establishment but to simply abuse and attack all of the establishment while displaying no fundamental principles is not going to work. We may not be far from the time when a person is chosen to explain to the President why his services are no longer needed. Other than Steve Bannon, the only reason anyone is hanging on to a top post in the White House right now is on the hope that Mike Pence will soon be their boss. Summers is attached to the "I" word. Remind him there is no "I" in the word, TEAM. Summers, like a clown, isn't to be taken seriously, I hope. A reminder of why I stopped visiting this site on a daily basis nearly a year ago. We don't need slick establishment types in the Trump administration. It's not good enough to be pro free market, pro capitalism and anti socialism. A political and cultural war is being waged, we didn't elect Trump to blow smoke up our asses and give us people who sound good on paper and fail miserably in practice.